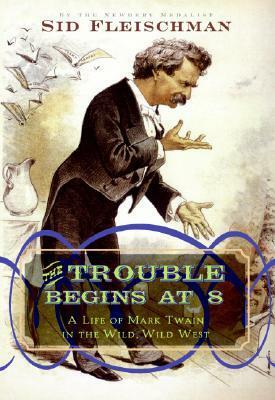 A thorough, detailed, beautifully written book about one of the most beloved authors of all time, Samuel Clemens, but we know him as the master-writer of Huck Finn and Tom Sawyer... Mark Twain. Sid Fleischman has once again taken a topic that causes most kids to run screaming in the opposite direction - and made it interesting, intriguing and most importantly - Fun! You will thoroughly enjoy the wisecrack for which the book is named..."The Trouble Begins At 8." The life of Mark Twain has been written about by some of the brightest minds, however, knowing these texts are written with a dialogue that will never reach children, Fleischman targets the young minds with his books. Not an easy task and yet he has been able to deliver the absolute perfect mix of educational information and entertainment to keep youngsters turning pages and parents happily observing. Sid Fleischman writes with an elegant, well informed simplicity that immerses the reader, breathing life into the pages of the book, so much so that at the conclusion it feels more like you have spent time with these people as opposed to having read a book about them. Every character, as well as, each stage of Clemen's journey contributes depth and richness to the story and has been beautifully captured in this unique, highly entertaining biographical book that reveals the creation of Mark Twain. From his early days in Missouri, through his quite interesting personal adventures; as a steamboat pilot, mining for gold, dancing the 'kangaroo' in San Francisco, just to name a few. While you may think you know all there is to know about Mark Twain you have never had the pleasure of reading anything quite like this. Complimenting the narrative are numerous black and white photographs that truly bring the legend to life. Often referred to as a 'gentlemen of leisure,' Mark Twain's life was above all, interesting. Sid Fleischman has captured the essence of this free spirited writer that today is one of only a handful of authors counted as true masters of the pen. I highly recommend this book to anyone interested in literature, regardless of age. Sid Fleischman is a talented writer and his ability to continually breath new life into old stories is unparalleled. This is an exceptionally well written and highly enjoyable read - Don't Miss it!